Following a successful collaboration between Leave It To Jane Theatre and Chris’ band, The Brave and Foolish, on a show called Diamond Studs (STERLING AWARD for Best Musical – 1991) Timothy F. Ryan asked Chris if he thought it might be a good idea to write a show of their own. So in the fall of 1991 Chris and Scott (Peters) got to work setting the poetry of Percy Shelley to music and Tim (Ryan) got to work adapting Mary Shelley’s gothic novel to work on the stage. The result was FRANKENSTEIN: THE MUSICAL. Described as a musical chamber play, the action takes place in the summer of 1816 in the home of Lord Byron. The five non-fictional characters who inhabit the play include Percy and Mary Shelley, Dr. Polidori, Claire Claremont and Lord Byron himself. Having been driven indoors by terrible weather they decide to invent horror tales to amuse themselves. After several failed attempts from Percy and Byron, Mary happens upon the idea for Frankenstein and begins to tell the tale, taking on the role of Victor Frankenstein. The others join in and become characters in Mary’s story as well. The play becomes a play within a play and begins to go in and out of the world of the Frankenstein tale and reality of Lord Byron’s front room. A first production of the show was produced by Leave It To Jane and went up at the Phoenix Downtown in May of 1992. The following season the Janes remounted the show at the Kaasa Theatre, with some major improvements to the script and score. 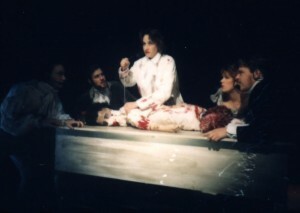 This highly acclaimed production of FRANKENSTEIN was nominated for numerous Sterling Awards including BEST PRODUCTION of a MUSICAL and BEST DIRECTOR and went on to win in the category of BEST SCORE. Plans to mount the show again in 2012 are being discussed.